Both companies are riding the telecom boom and growing fast, but there’s little to suggest that the #2 will overtake the leader anytime soon. Ashok Jain, 50, Chairman And Managing Director, Arihant Capital Market, a listed stock broking firm, prefers the Reliance Communications stock compared to that of Bharti Airtel. And why not? In the current financial year (till November 19, 2007), Reliance Communications has posted the biggest gains among telecom stocks, rising 69 per cent against 19 per cent by Bharti Airtel. The average for telecom companies is 54 per cent. Until last fortnight, Reliance Communications was the only telecom stock in Jain’s portfolio. However on November 2, 2007, when the gap in market capitalisation of the two companies narrowed down to about Rs 8,500, Jain bought 1,000 shares of Bharti Airtel. “But, I still prefer Reliance Communications to Bharti Airtel because of its aggressive promoter and the fact that compared to its peers, it has superior distribution and infrastructure reach.” What clinches the argument for Jain is that Reliance Communications is unlocking the value in its tower and the undersea cable businesses. “Unlocking of value from the tower businesses of both companies and the listing of (submarine cable company) Flag Telecom are the triggers for the stocks. Growth in the sector will continue unabated over the next two years,” says Jain. Bharti Airtel and Reliance Communications, which together account for 42 per cent of total cellular subscribers in India, are the primary drivers of the sector's impressive performance on the bourses. Consequently, both have improved their ranking on the BT 500 list; Bharti Airtel has jumped to #2 in the pecking order from #4 last year, while Reliance Communications climbed three places to #6. Barring Reliance Industries, which maintained its numero uno position, Bharti Airtel and Reliance Communications have gained the most in absolute terms. For the first half of this financial year, the average M-cap of Bharti Airtel surged 114 per cent, or Rs 85,621 crore, to Rs 1.60 lakh crore compared to Rs 75,121.5 crore in the comparable period last year. Similarly, the M-cap of Reliance Communications surged 181 per cent, or Rs 67,480 crore, to Rs 1.05 lakh crore from Rs 37,206 crore. But the gap in their M-caps has been narrowing as the Reliance Communications share gallops faster than Bharti Airtel (see Playing Catch Up). The company enjoys a market share of nearly 18 per cent, but in circles where the company provides both CDMA (Code Division Multiple Access) and GSM (Global System of Mobile Communication) services, this rises to 30 per cent. Although the seven circles where it has dual services are small, the market expects Reliance Communications to significantly improve market share once it launches GSM operations. The proposed new regulatory measures tightening subscriber-linked criteria for spectrum allocation, increasing annual spectrum usage charges, permitting dual technology under USAL (Unified Access Service Licence) and mobile number portability have also been positive for Reliance Communications and negative for existing GSM operators; these have also helped the Reliance Communications stock. 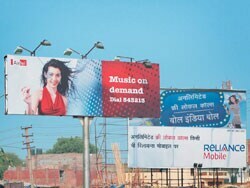 So, can R-Comm topple Bharti Airtel in M-cap and market share? In terms of financials and market share, Anil Ambani’s company still has some catching up to do with Sunil Bharti Mittal’s flagship. For the first half ended September 30, 2007, Bharti Airtel reported an 85 per cent rise in net profit to Rs 3,125.5 crore (Rs 1,688.7 crore) on a 49 per cent jump in net sales to Rs 12,242 crore (Rs 8,213 crore). Reliance Communications, on the other hand, posted a 108 per cent jump in net profit to Rs 2,525.6 crore (Rs 1,215.4 crore) on a 31 per cent increase in net sales to Rs 8,882.5 crore (Rs 6,776 crore). Interestingly, both had operating profit margins of 28 per cent.